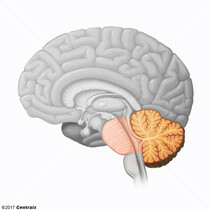 The anterior portion of the developing hindbrain. It gives rise to the CEREBELLUM and the PONS. The part of brain that lies behind the BRAIN STEM in the posterior base of skull (CRANIAL FOSSA, POSTERIOR). It is also known as the "little brain" with convolutions similar to those of CEREBRAL CORTEX, inner white matter, and deep cerebellar nuclei. Its function is to coordinate voluntary movements, maintain balance, and learn motor skills. 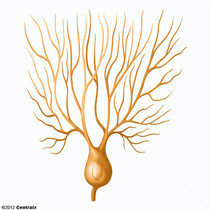 The output neurons of the cerebellar cortex. 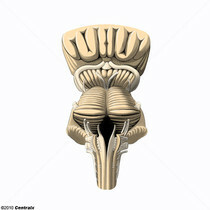 The lower portion of the BRAIN STEM. It is inferior to the PONS and anterior to the CEREBELLUM. 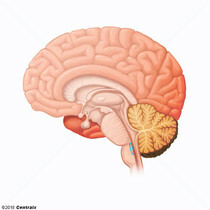 Medulla oblongata serves as a relay station between the brain and the spinal cord, and contains centers for regulating respiratory, vasomotor, cardiac, and reflex activities. 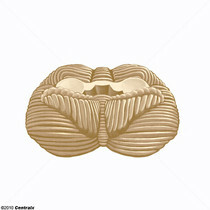 A small, rounded eminence on each side of the FOURTH VENTRICLE, which receives nerve fibers from the SOLITARY NUCLEUS; SPINAL CORD; and adjacent areas of the MEDULLA. The area postrema lies outside the BLOOD-BRAIN BARRIER and its functions include acting as an emetic chemoreceptor.